The very first thing that you will notice about the Delta 36-L552 Unisaw is that it comes with 5HP as compared to the more common 3HP which is synonymous with similar machines. So instantly, you know that it delivers enormous power. This machine is also one of the easiest to adjust and fine tune components on. Therefore, this machine is great for professionals but also for beginners as they can play around with settings without having to stress about the safety mechanisms and so on. The sturdiness and stability is also top notch thanks to the solid cast iron construction. It contains a large table top area do space will never be an issue. The measuring instruments such as the miter gauge and sliding fence are said to be of premium quality. This is a major bonus since many other models struggle with these measuring tools. Maintaining this machine should not be an issue, provided you read the user manual and check the inner parts from time to time. The blades need alignment and adjustment. It requires extensive assembly and fine tuning. What safety mechanisms does the Delta 36-L552 Unisaw have? It contains the anti-kickback safety feature, which is standard, yet very effective. It also contains extremely low levels of vibration while in use, which makes it even safer to use. How powerful is the Delta 36-L552 Unisaw? It has a powerful 5 horsepower as compared to the standard 3 horsepower that similar models have. What’s My Take on The Delta 36-L552? The machine is undoubtedly premium quality. Everything about it from the materials used to make it to the sturdiness and reliability of the machine shows that it was made for heavy-duty work. The size of the table top is large enough to never have to worry about having enough space again. The amount of power contained, which is 5HP is more than enough to cut through the toughest pieces of wood without breaking a sweat. Because it has a single cast trunnion, both adjusting handwheels can be found at the front of the saw. This machine is designed to work seamlessly for hours on end. Perhaps, one of the only drawbacks of the Delta 36-L552 Unisaw is its mobility base. Although its well constructed and ideal for moving the saw, some customers have experienced broken welds due to less than sturdy construction. However, if you are a professional with many large projects coming up, this machine is your best bet. Most table saws come with the dust collecting feature. However, this one has a dual dust collecting feature. This enables it to catch shrouds as the falls off the blade and also collects dust that falls to the bottom of the cabinet. The Delta 36-L552 Unisaw also contains dual front cranks. This enables you to adjust the angle and height of the blade from the front of the saw. Users will be pleased to know that the Delta 36-L552 Unisaw is the only model in its line to offer a single cast, trunnion system which makes operation smooth. It also allows you to clearly see the bevel gauge. This machine utilizes the Biesemeyer fence, which has a history of being accurate and high quality. The fence slides and locks firmly in place. It hardly ever needs adjustment to remain parallel to the blades. Durability – The cabinet has a fairly large cast iron base. This gives it more than enough stability and a solid footing. Power Usage – The Delta 36-L552 Unisaw – Cabinet Table Saw has a powerful 5HP as compared to its the 3HP that it is also available in. It runs on a standard 220v power outlet. In order to get the maximum use out of this and ensure that you use it correctly, you will need a 40 amp circuit and a 10 gauge wire, to prevent or avoid burn out. Ease of Use – This table saw is naturally heavy, so ensure that you fine tune things like the wings, fence and extension table. While it might seem like hard work getting it properly set up, you only need to go through this process once, unless you move house. The 52-inch Biesemeyer fence is a really user-friendly feature that allows you to repeat cuts without having to re-check every time you move from the table. The extension table is also great for work that requires extra surface space and the underneath can be used as additional storage space. Safety features – As far as safety mechanisms go, it isn’t impressive. However, it does contain the standard anti-kickback mechanism and is an overall safe table saw when compared to other models. Front Mounted Cranks – The two front-mounted cranks make it easier for you to make any adjustments to the blade from the front of the saw. This refers to height and angle. So now all your cuts can be measured and controlled by using the bevel from the front of the saw. This machine includes the 52-inch Biesemeyer fence and tube, unisaw black table board and fence legs. It is also advised that you only use accessories that are recommended for this model. This table saw is great for professionals thanks to the incredible 5HP. It can, therefore, cut through various widths of wood effortlessly. So it is ideal for heavy-duty projects. If you are a professional carpenter and have a series of long projects, this machine is definitely for you. However, even if you are an inexperienced DIY home user, adjusting components on this machine is so simple and convenient that even amateurs can do it. 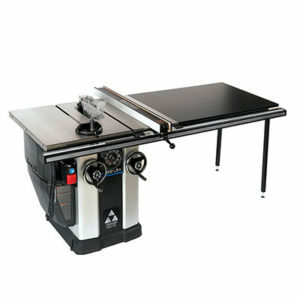 This solid cast iron table saw is suitable for building the odd cabinet or drawer, however, it is definitely up to heavy duty professional carpentry as well. What I didn’t like about this Saw? This machine requires a lot of assembly, so if you are inexperienced and setting up a table saw for the first time, you can either read through the instruction manual for help or alternatively you can ask an experienced carpenter to help you get set up. This could save you days of time and effort. Lots of customers complained about the fence on this table saw. The faces are apparently wavy and not parallel. Lining up the fence to the miter is also a challenge. The fence cursors are also very far off the rail. For the small fortune that you pay for this table saw, they really could have spent more time on perfecting the fence. The SawStop table saw is reliable, sturdy, well designed and gets the job done. It also includes some impressive safety features, however, it is a bit on the expensive side. It has typical features for optimal precision and performance. However, its safety features are extraordinary. One of the most significant safety features is the patented blade termination system. It is designed to stop within a millisecond of being touched. The JET 708675PK is great for both professionals and amateurs alike. It is a premium saw that contains various features and benefits. It only contains 3HP however, it is still sturdy and powerful enough to complete a heavy duty task. It gets the job done and its priced just right as well. So while it may not be packed with as much power as the Delta 36-L552 Unisaw, it definitely is a bargain. The shop fox w1819 has standard 3HP. However, it has no trouble cutting through any thickness of the wood. It contains a handy dust collecting feature as well as the anti-kickback safety feature. Most customers enjoy the accuracy and precision, while the price is the icing on the cake. Customers love the fact that it has extra safety features. The unit is also designed to run for hours on end and this makes it ideal for professionals who need to use the machine for several projects on end. It also contains great precision and accuracy as well as being affordable at the same time. This machine is ideal for anyone who needs a table saw that can take care of all types of jobs. So no matter how big or small the job you need to be done, rest assured that the Delta 36-L552 Unisaw is right for you. It may be a bit on the expensive side, however, with new and improved features, as well as additional safety mechanisms, this table saw is a great buy.